After Jesus’ death and resurrection, he remained on the earth for forty days (Acts 1:3). He appeared to, conversed with, and was touched by his disciples. 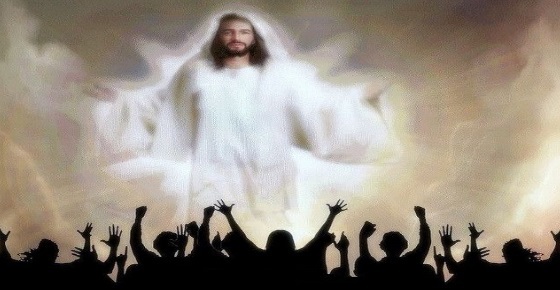 On one occasion in particular, Jesus was seen by over 500 individuals at once (1 Corinthians 15:6). He provided further teaching, he spoke of his return, he gave the Great Commission, and then he ascended to heaven in front of His disciples. As Luke recounts, “He lifted up his hands, and blessed them. And it came to pass, while he blessed them, he was parted from them, and carried up into heaven” (24:51). His description in the book of Acts provides a parallel account of the same event: “While they beheld, he was taken up; and a cloud received him out of their sight” (1:9). Jesus did not just disappear, never to be seen again. His disciples witnessed his ascension into heaven, as well as the declaration of angels immediately following, that “this same Jesus” would come back again “in like manner.” Jesus’ ascension was literal, physical, and historical; and his return will be in like manner. While of course we do not have any eyewitness accounts of what happened after Jesus ascended into heaven, we do have inspired revelation. Paul says that God has “highly exalted” Jesus (Philippians 2:9; Ephesians 1:20-21). Peter informs us that when Jesus ascended into heaven he took his rightful place at the right hand of God, and every authority in heaven and in earth was placed under him (1 Peter 3:22). We can be sure, then, that Jesus’ own prayer has been answered, that the Father would “glorify” Jesus with the glory he had before the world was made. (John 17:5). Jesus is right now seated at God’s right hand. But his ministry has not ceased, nor is he merely waiting until he returns to earth. Christ’s present ministry includes preparing a place for believers (John 14:2-3). That alone is breath taking to consider! It took only six days to create this entire universe — what must our heavenly accommodations be like, which Jesus has been preparing for 2,000 years! Jesus is also engaged in on-going, empathetic mediation for his children. When we sin, therefore, we have an advocate with the Father, Jesus Christ the righteous (1 John 2:1). The very one who paid for our sins, and who has given us his perfect righteousness through faith, is advocating for us in heaven! No wonder the writer of Hebrews exhorts us to “come boldly” before the throne of grace! We enter a throne room that is occupied by the very one who has paid for our sins, who is touched by our weakness. In answer to the needs of his people, Jesus has “poured out” the Holy Spirit—with all his comforting, sustaining, guiding power and wisdom—among his people (Acts 2:33). Jesus promised that the presence of the Spirit with us would be superior even to Jesus’ own physical presence with us (John 16:7). Yet, with all this labor taking place there is also a certain anticipation permeating heaven. Whether we on earth recognize it or not, there is a day approaching. It is the end of all days, the day of the Lord, in which every knee will bow and every tongue will confess that Jesus Christ is Lord. Jesus must reign until he has put all his enemies under his feet (1 Corinthians 15:25). “Behold, he cometh with clouds; and every eye shall see him, and they also which pierced him: and all kindreds of the earth shall wail because of him. Even so, Amen. I am Alpha and Omega, the beginning and the ending, saith the Lord, which is, and which was, and which is to come, the Almighty” (Revelation 1:7-8). Jesus is coming, and every eye will see him. Jesus is described in verses 5 to 6 in terms of the great Redemption that he has accomplished for every believer — he loves us, he has saved us from our sins, and he has made us into a kingdom whose one common ground is Jesus. But the emphasis is not on us, but on the fact that such a beautiful redemption means all glory and power belong to him! Gone forever is the humiliation of Jesus the Christ. No more is Jesus a lowly baby in a trough, or an unknown carpenter’s son, or even a great teacher who is submitted to earthly authorities. Jesus is no longer the humble, patient, longsuffering Messiah. Yes, Jesus is still the Lamb… but the Lamb is on the throne. Jesus is “the Alpha and the Omega” — the One who created everything in the beginning for his pleasure, and the one who now is drawing all Creation to its conclusion. Jesus is “the Almighty” — there will be resistance at the end, but resistance is futile because all power belongs to Jesus! We are reminded of the cosmic dimensions of Jesus’ rule: there is nothing that is not under his power and authority. The leadership of nations, the movements of terrorists, the activities of nature — all are under Jesus’ control, and are ultimately answerable to him. Yet we must also apply this intimately and personally. Jesus is sovereign over the details of my daily life. Every decision, every opportunity, every challenge, every motivation is to be submitted to Jesus. He is not only the glorious King of kings; he is to be the king of me. In the Revelation, we are told to “behold”, to consider this Jesus now; because this exalted, almighty Jesus is coming soon and every eye will see him. Jesus is coming whether we want him to or not, whether we look for him or not, whether we reject him now or not. When he returns, every eye will see him! How will you see him then? As righteous restorer and comforter, or as almighty judge?